The Pronounce Skincare Total Face System – Four steps to cleaner, healthier, more radiant skin! If you want to get your face in tip-top-shape through *truly* healthy, organic, non-toxic means…you are in the right place! With my carefully selected certified organic, raw, unrefined ingredients, the Pronounce Skincare Total Face System is great for ALL skin types. Looking to maintain your already clean and healthy skin? This will do it! Looking to soothe dry and flaky skin? With the nourishing ingredients I have selected…yup, this system is for you! Do you have troubles with acne or oily skin? You need this oil battling Total Face System (look for picture-proof below)! Step 1 >> Clean – Start the system with a gentle, yet incredibly effective cleanse using your new Face Cleaner. Ingredients: Witch Hazel, Castile Soap, Filtered Water, Aloe Vera, Castor Oil, Vitamin E, Carrot Seed Oil. Essential Oils: Lavender, Patchouli, Frankincense, & Geranium. Learn more about the Face Wash here. Step 2 >> Tone – Now that you have washed those pores, it’s time to soothe and calm them…and give your face a mist of cooling, beautifully toning Scratch Mommy Face Toner. Ingredients: Witch Hazel, Rose Water, Vitamin E. Essential Oils: Lavender & Tea Tree. 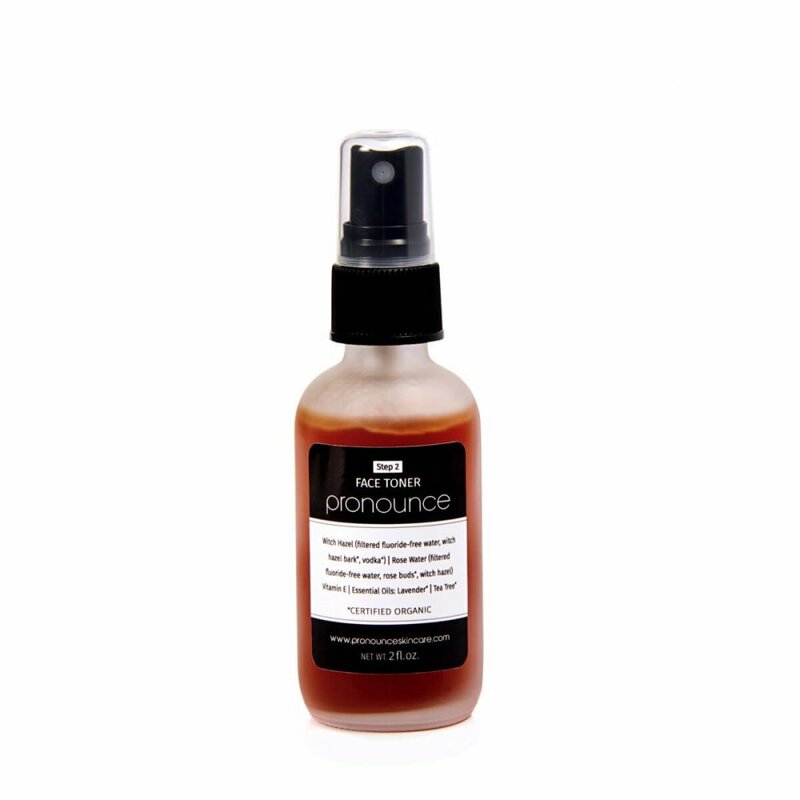 Learn more about the Face Toner here. Step 3 >> Moisturize – Your face needs moisture, whether dry or oily, and this moisturizer fits the bill either way. Delicate, yet powerful, your face will thank you for using your new Face Lotion. Ingredients: Distilled Water, Almond Oil (Infused with organic lavender herb), Aloe Vera, Cocoa Butter, Coconut Oil, Beeswax, Carrot Seed Oil, Sea Buckthorn Oil, Rosemary Antioxidant Oil, Vitamin E. Essential Oils: Lavender & Sandalwood. Learn more about the Face Moisturizer here. Step 4 >> Rejuvenate – Let’s ‘face’ it (pun intended)…you are hard on your face; we all are! It’s the lives we live and the places we visit and the things we do. It’s good old Mother Nature and Mother Time, too. But, with my Face Serum treat you can help your skin truly radiate! 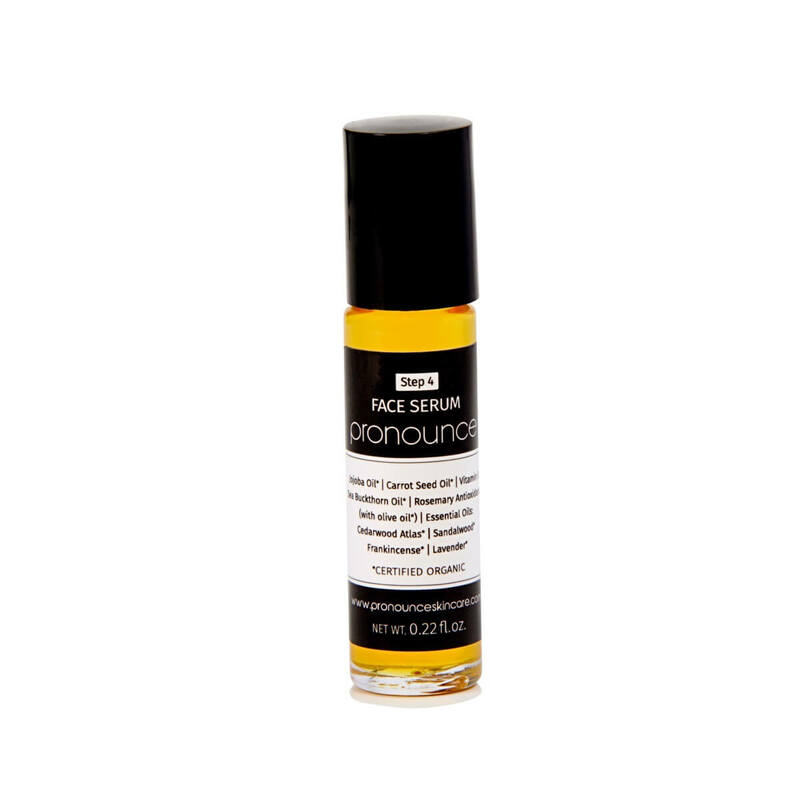 Ingredients: Jojoba Oil, Carrot Seed Oil, Vitamin E, Sea Buckthorn Oil, Rosemary Antioxidant Oil. Essential Oils: Cedarwood, Sandalwood, Frankincense, & Lavender. 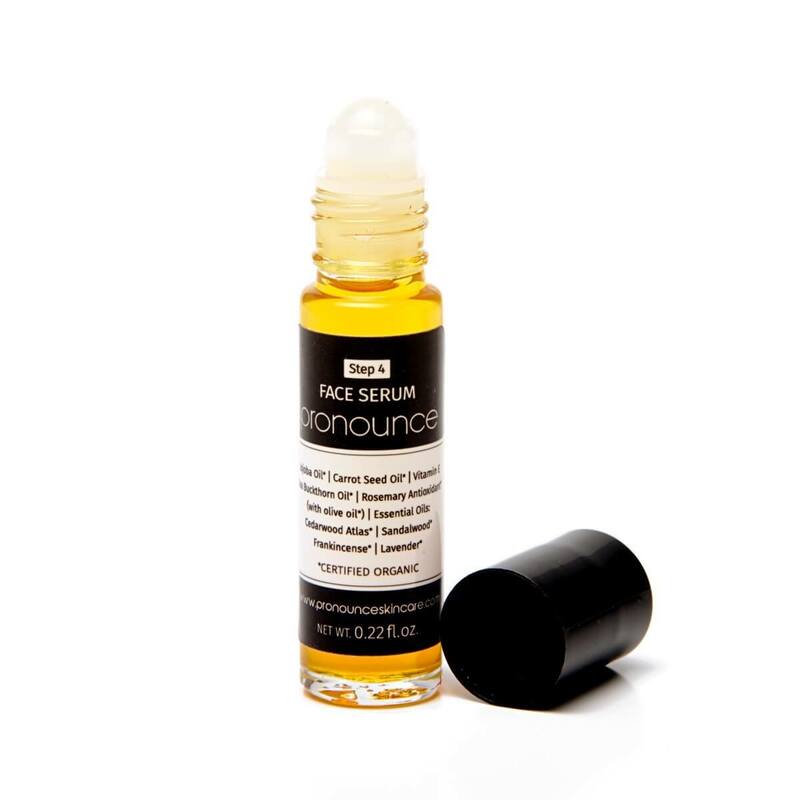 Learn more about the Face Serum here. You can purchase each item separately in the shop, but I’m beyond happy to bring my tried-and-true Total Face System to you all together in this bundle, at a discounted price! Buying the entire system saves you 15%+ off the total price you would pay to purchase them all separately!!! All containers are thick-walled glass jars, so all of your new face goodies are housed in glass…perfect! 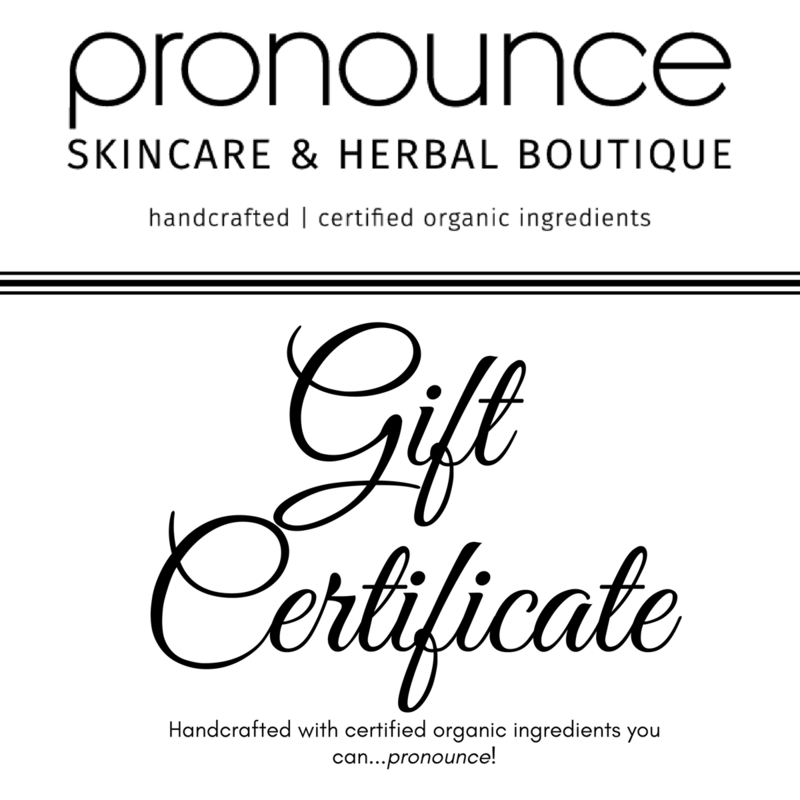 All ingredients in the Pronounce Skincare Shop are *ALWAYS* the finest quality: Certified organic ingredients, raw, unrefined, sustainably-sourced, & fair trade. I only order through the best suppliers for my bulk ingredients. That is a promise, for now and for always. I want the best not only for MY family, but for YOU and YOUR family! *Always make sure that you apply your healthy new Face Moisturizer with clean hands, take care to not get water into your jar, and keep it stored in a cool and dry place with the lid tightly secured. I do not use preservatives (which is a good thing! ), only antioxidants Vitamin E and Rosemary Antioxidant. With care taken, your Face Moisturizer will last at least 3 months. CLICK HERE & learn how to use your new Total Face System! Let me just tell you. If you are questioning oh my gosh that kind of a lot for this system, DONT. It is worth EVERY PENNY!! My face has never been more clear in all my life, I have struggled with acne my whole life and I will never use any product or system again!! Absolutely love this system!!! <3 GAH! And *this* is why I strive to create healthy skincare goodies that really make a different. I'm so happy that you are also seeing such amazing results. Thank you for sharing your feedback with others! The BEST facial system EVER! I have tried multiple facial care systems in the past. I have some dry spots, some oily spots…really, just difficult to “get it right.” I’ve stuck with systems for months…no relief. That is, until Pronounce Skincare’s Total Face System. I can HIGHLY recommend this system to really anyone! Jess has hit the mark with this one. I’ve been using it for almost 3 months now, but after only about 2 weeks I started to see REAL relief. My face looks and feels better than it has in a long time; longer than I can ever remember. Do it…make the jump to the clean, healthy products in this system. You will not be disappointed. THANK YOU, JESS! I have been on a topical prescription for my acne. I wanted to get rid of my toxic face wash and start using a more natural alternative. I was nervous because my skin is very sensitive to new products. But, this system and helped me clear my skin! The only thing I would like it to do better is to clean out my blackheads. Other than that, it’s a great investment! Hi Hannah! I’m so glad that you are loving the Total Face System, too. 🙂 As for blackheads, I’m not sure if you are doing a weekly facial scrub, but that’s something to consider adding into the mix. 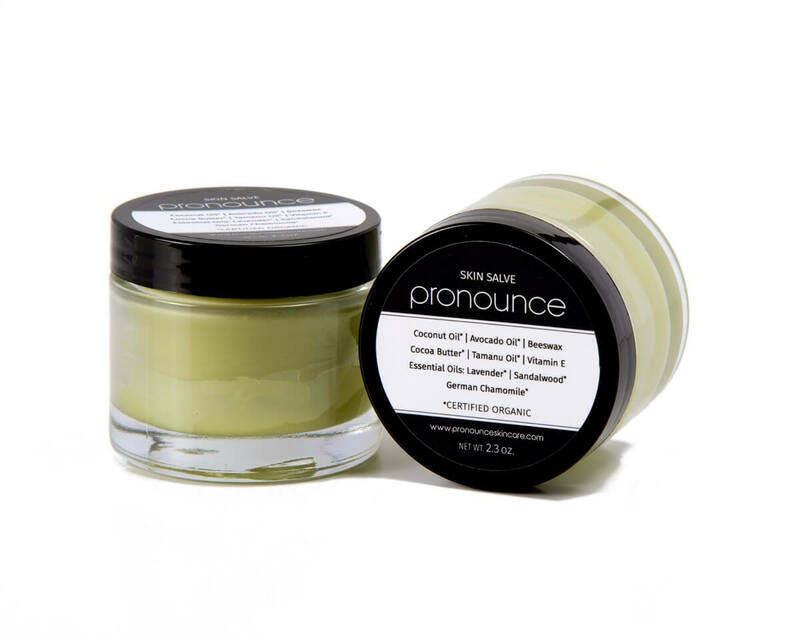 Here is our Pronounce Skincare Face Scrub…it’s great for blackheads and whiteheads, too! We also have a lovely Face Bar, which is an amazing detoxifier. You might consider adding one or both of these into your facial care toolkit. Again, so glad you love the products, too. 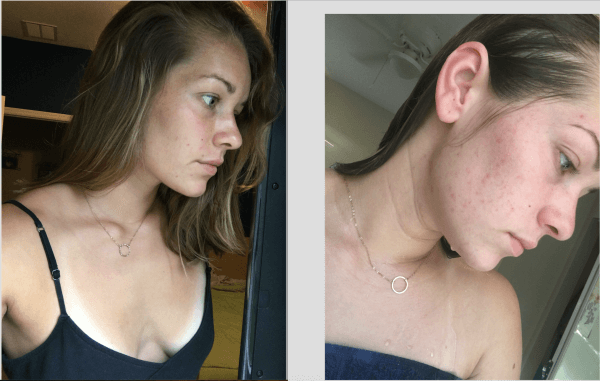 Here is a before and after of using this product for two months! I am currently in the middle of my cycle, so my skin isn’t perfect right now, but it usually 100% clear! Highly recommend to people who live an active life style. This is my second purchase of the set. This one is for my 13 year old daughter. I am so happy she has good, clean products to put on her face!! Love, love this set!! <3 Fantastic! I'm glad you have your daughter on the right path for healthy skin. Yay! 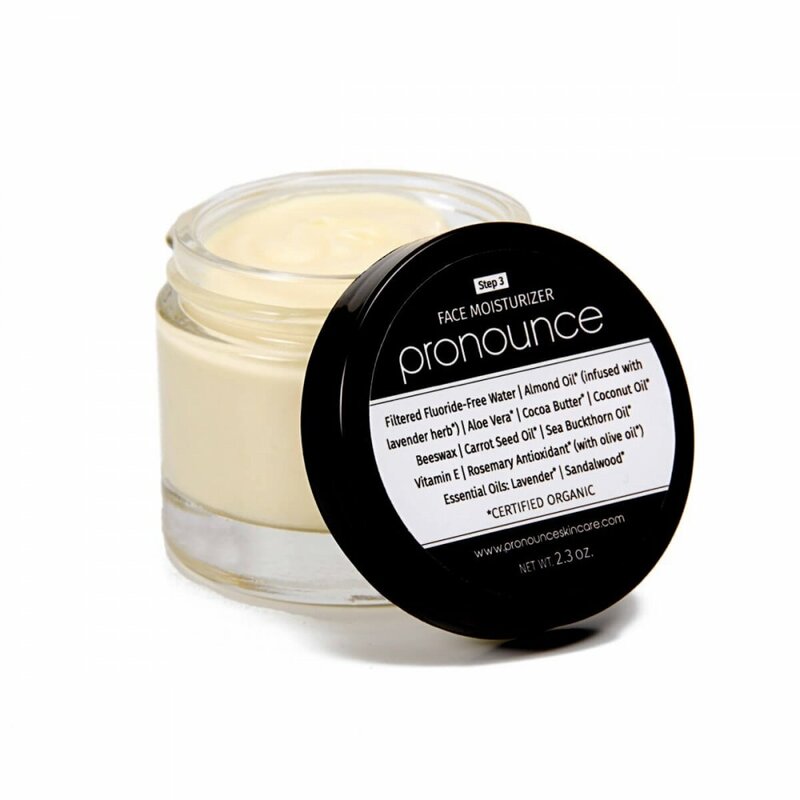 I came across Pronounce while searching some natural DIY recipes for make up last summer. I fell in love with their message and the ingredients used in their products immediately. I have been working on switching all of my skincare and household products to natural and organic substance for the past year. I had been sincerely disturbed when discovering what types of chemicals were in my face care products, and even more apalled when it came to the chemicals in make up. Long story short, I saved my pennies and purchased the total face system and have been in love since the first day using all the products. My skin feels healthy and refreshed. And my mind is happy with the switch to safe products. I am not kidding you when I say that my skin started to clear up starting overnight. 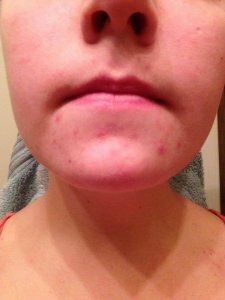 And within the first week my acne and redness seemed to disappear. This skincare system is a must have and worth every penny! <3 I am so glad you are receiving such relief. So exciting! I'm really impressed with the Total Face System! OK, I have to be honest here. I tried the total face system back when it very first came out and, while I loved the cleanser, I wasn’t that excited about he rest of the system. I’m really sensitive and and something about it was irritating my skin. So, I was only buying the facial cleanser. I was also buying the rose water toner to go with it, but that has since been discontinued on the website. I felt like the rose water toner wasn’t as harsh, even though it’s made with the same basic ingredients as the regular facial toner. Well, I happened to go the brick and morter shop in Bloomington and have a conversation with Jess. She told me about some changes she had made to the product line a while back. This prompted me to want to give the Total Face System another try during her reason holiday sale. Wow, am I glad I did! I’ve been using it for just under a week now and it has made the biggest difference in my skin! It’s so much softer and I can already see a slight difference in the appearance of my fine lines and wrinkles. Bonus, it doesn’t seem to irritate my skin at all this go around. The changes she made some time ago have really made a difference in how my skin reacts to the system!!! Thanks so much for always researching and striving to improve your products! The time and care you put into your products is one of the many reasons I’m a loyal customer. If you haven’t tried this skin care system yet, give it a go. You won’t be disappointed. I am very pleased with these products. They make my face feel wonderful and I can already feel a difference. I would have given 5 stars except for a couple of things. The moisturizer is too thick for the pump bottle that is comes in. I have to dig it out with the pump stick. It might be better to put the moisturizer in a jar. Also it would be nice if instructions came with the products on how to use them. Other than those couple of suggestions I am very happy with the products and love that they are all natural and are a good price point. What type of skin does your facial care kit work best for? Hi Laura! It’s a very well-balanced facial care system and has worked wonders on all skin types, from oily to dry (including combination). Please take some time to read the “discussion” tab here, which showcases customer reviews. I have been using this for two weeks now and I have found that my face is no longer feeling oily by mid day, which I love… As a side note, I only use the moisturizer at night since it does not have sunscreen in it and you have to use a separate sunscreen. I do not want to keep putting layers of product on my face so I use a different moisturizer during the day and this moisturizer at night. Loved every part of this set, great ingredients, nice smell, happy face! I have been using this product now for about 2 months and I LOVE it! For years I had been using another very well know face care system for Acne mainly, but felt that my skin had changed in they way it needed to now be taken care of … enter from stage right Pronounce Skin Care! Thank you so very much for making a product that not only feels wonderful on my skin but it actually doing it some good as well vs. putting a ton of chemicals on it! The cleanser and toner are great. love how they make my skin feel. I wasn’t sure about the face cream the first time I used it. My skin was very shiny, but it absorbed fairly quickly. I absolutely love these products. It has only been a couple of weeks but my skin feels great. I highly recommend these products. I’ve been using the Total Face System for a little over a month now and at first I wasn’t too impressed. First wash left my skin feeling a bit oily and not as “clean” as when I used the store bought, chemical-filled cleansers. I thought it’d take some getting used to because the “clean” feeling I was used to was just my skin being completely stripped bare. Well, after a few more washes my skin still felt a bit too oily and not in a moisturized way so I thought this was a bust. However, I refused to give up (mainly because I couldn’t bring myself to buy a store cleanser again, too many chemicals!). I decided to use the cleanser the same way I use oil when I opt for the oil cleansing method and that’s to wipe it off with a warm/hot microfiber cloth! Best decision ever, after using the microfiber cloth to remove the cleanser rather than rinsing it off, my skin felt moisturized and not oily. I took off one star off for the rose water spray, I think it’s too harsh for certain delicate areas (specifically, my eye lids…I noticed them drying out and the skin getting rough) so I’m going to experiment and update this review when I know for sure. So, aside from step 2 (jury is still out) everything else works GREAT. I have oily skin and it’s nice to look in the mirror in the morning or at the end of the day and not see a shiny face! Leeya…I’m so glad that you are loving my products and they are working so well for you. 🙂 I really appreciate this thorough and honest review. Thank you! Perhaps the Toner (I think that’s Step 2 to which you are referring with the spray) maybe it’s just not a good fit for you. Boo! I look forward to hearing how your experimenting with it goes. Perhaps by not applying it to your more sensitive areas, but elsewhere, you’ll find it works well for you. Continue enjoying that not so shiny face! Love the all natural ingredients! It smells great and my skin looks amazing! I have been very pleased with all the facial products. 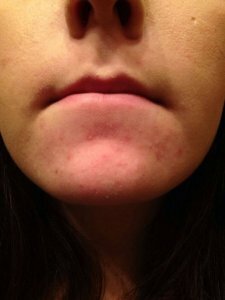 I have large pores & if not careful experience cystic acne. This being said, my skin looks great when I use these products. I’ve used many products over the years. This is hands down the best I’ve used. I’m always looking for a clean non-GMO, organic products. Thank you for providing an excellent product. Plus, I believe my skin looks better now than it has in a while. Where has this been my whole life?!? I’m so impressed by this product and I have only been using it for a week now. I am a former consultant for skin care products and after learning about everything that was in them I began the search for natural products. This line is a lifesaver for anyone who struggles with skin issues (like i have for years) The face wash is my favorite because of the smell and the way it makes my skin feel. AHHmazing! I use the whole line and i will b e a forever customer. Its such a relief knowing that the products you use are actually safe and helping your skin. My skin is going through a bit of a detox period but i can already tell a difference in my tone and appearance. Side note: I had horrible dry spots around both of my eyes and tried everything but it only seemed to temporarily help me. This line has already done wonders for me in just a few days. Thank you so much! 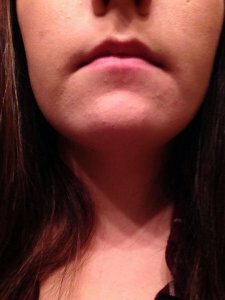 I use to have super oily skin and just recently my skin started cracking on my cheeks and nose. I couldn’t wear make up powder or foundation. After just 4 days my skin had a natural sign and I have to say I’ve never felt it so soft ever in my life. I use to use products like Lancôme and Clarins and it worked for the first week then my skin would begin to burn and crack as usual, and I would have to go back and but more products that would only temporarily work. I love how my skin never burns or feels stripped from these products and I use them twice a day. Definitely my go to from now on. I have roseacea and have tried lots of different products and this one far and above works the best. My skin no longer looks angry and I am now just left with a rosy glow. The soap is gentle but keeps my skin feeling very clean. I do not use the toner on my cheeks; only on my T-zone, which is relatively oily considering my cheeks are kinda dry. The moisturizer feels luxurious. I use the moisturizer all over and then add the foundation only to my cheeks. It gives me a finished look and adds extra moisture. The serum feels lovely, although at night I only apply it to my cheeks. Love the ingredients! The moisturizer does leave my face slightly shiny. I was skeptical, I admit, especially when the cleanser didn’t lather up. But it works! It does clean my face & leaves it soft & not overly tight or dry. My only concern is that I feel I have to use a lot of it to clean my entire face & neck which makes my supply go very quickly. But that won’t keep me from ordering more! I have never been someone that was very good about being consistent with my face cleansing routine. After searching for a while, I stumbled across scratch mommy on Pinterest, and decided to go for it. All it took was one day, and I was sold! By the end of the first week, I could already tell a big difference in how my skin looked and felt. You have a customer for life!! Love these prodcuts! They are amazing! The soap feels like water, but truly cleans your face. LOVE the toner. The best face system I haver used.!!! I have dry skin and have used many products that were expensive high end facial systems that just left me looking for something better. I never thought this simple good for you system would work. But just after a few days of using it my skin is soft and radiant !! I love it!!! And don’t think I ever will be without it. I look forward to using it because I just love seeing how my skin has improved. Great products are simple products that truly work!!! I have quite a few skin issues, so I’m hoping these products help! What I can tell you so far is that my skin is very soft! Wanted to give this a try and so glad I did. Only used it for 3-4days so far, but that enough to love it so far ???? Are the products in the Total Face System the same size containers if purchased separately? Yes, products in the Total Face System are the same sizes as if they are purchased individually. I absolutely LOVE these products. I have very sensitive skin and was apprehensive at first. This product cleans gently, moisturizes perfectly and leaves my skin soft and refreshed. I have had better results with this skin care line than any other I’ve ever tried. These products are safe and gentle. I will be a user forever! I will continue to purchase this skin care line, not only for myself, but for the rest of my family as well! Thanks so much and keep up the great work! Perfect! Every product is the best I’ve tried! The face lotion is light and does not leave a greasy feel that lingers yet does the job for my combo skin! Fast shipping also. Very satisfied! I have been using my products for about a week and a half now, and I absolutely LOVE them!! The face wash is very refreshing, and the moisturizer is very light on the skin.